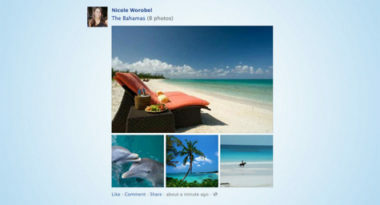 Facebook has been enhancing its visual appeal the last few months and the most recent update applies to its news feed. These new improvements include making photos up to two times larger, changing the look of photo albums to display one large photo on top and three smaller photos on the bottom, and making the text in status updates more prominent so it’s easier to read. CNet.com reported on these new attractive design developments. These new changes are only the latest in a series of enhancements to the social media site. In April, Facebook increased the size of users’ profile photos to make them more distinct, while May ushered in the shift to larger photos in the mobile news feed. Industry experts speculate that May’s mobile photo upgrade may have been the result of Facebook duplicating the way that its recently acquired Instagram features photos on its mobile news feed. It may also have something to do with the booming popularity of the image-centric Pinterest, along with the realization that images have become more important than ever among the social media community. Regardless of the reasons, all of these visual upgrades show how Facebook is sharpening its focus on its aesthetic appeal. They also demonstrate the importance of images in an overall content strategy. It will be interesting to see if this emphasis on images sparks a trend among other online platforms such as Google+, blogs, and geosocial networks. At MDG, our 360° marketing approach uses just the right mix of traditional and online media to reach your company’s marketing goals. While some industries may fare better in print and others with social media marketing, we strive to create a balanced approach where digital and traditional marketing efforts support each other and your marketing message is tailored to the medium. To learn more about incorporating Facebook into your social media marketing strategy, contact MDG Advertising at 561-338-7797 or visit mdgadvertising.com.